For Vessel Reporting Information, Click Here. Papahānaumokuākea Marine National Monument (Monument) was designated a "Particularly Sensitive Sea Area" (PSSA) in 2008 by the International Maritime Organization, to protect marine resources of ecological or cultural significance from damage by ships while helping keep mariners safe. "NOAA welcomes this additional layer of protection and international recognition for the Papahānaumokuākea Marine National Monument," said retired Navy Vice Adm. Conrad C. Lautenbacher, Ph.D., former Under Secretary of Commerce for Oceans and Atmosphere and NOAA Administrator. "This designation will alert international mariners to exercise extreme caution when navigating through the Monument." 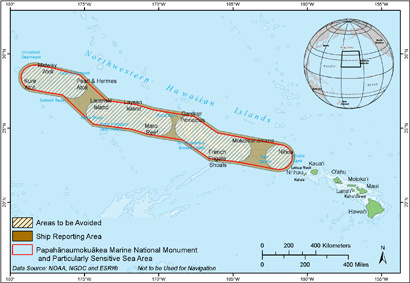 The Particularly Sensitive Sea Area designation establishes four special zones known as "Areas to be Avoided" (ATBAs) on international nautical charts to direct ships away from coral reefs, shipwrecks and other ecologically or culturally sensitive areas that may pose a navigation hazard (73 Federal Register 233 (3 December 2008), pp. 73592 - 73605). Additionally, an integral part of this management strategy has been ship monitoring. Vessels planning to pass through the Monument PSSA on their way to or from a U.S. port or place must notify managers entering and exiting according to the Monument's ship reporting requirements. Franklin, E.C. 2008. Marine Pollution Bulletin 56: 150-153. Link to our PSSA announcement!